But there are certain areas of a home even the most tidiest of people forget to clean. These areas are easy to overlook for a variety of reasons, either because they blend into a room or they’re simply out of reach. From baseboards to ceiling fans, here are five deep cleaning tips for the more not-so-obvious cleaning spots in the home. Keeping these areas tidy will have your home looking brand new. An easy way to remove the dust from your window blinds is by spraying an all-purpose cleaner onto a dry cloth or a tube sock. Using your thumb and forefinger, pinch one blind and run your fingers the length of the blind. Deep cleaning schedule: You should clean your blinds at least once a month. Air ducts collect dust, hair, cobwebs and more that spreads throughout your home. 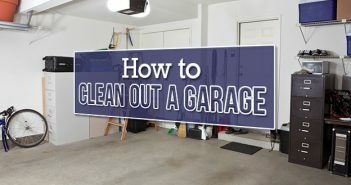 To clean them, turn off your HVAC unit and unscrew the air duct covers. From there, vacuum the ducts. Deep cleaning schedule: To extend the life of your HVAC unit and maintain a healthy air quality inside your home, you should regularly wipe them down and change out the filters. Have you ever turned on your ceiling fan and dust proceeded to fly off? That’s when you know it’s time to clean it. To clean a ceiling fan properly, grab a step stool or a small ladder and wipe down the blades with a rag or slide and old pillowcase over a blade. Deep cleaning schedule: In order to keep dust from getting redistributed into the air, you should clean your ceiling fans once a week. Even though baseboards are in every room, they are some of the most overlooked features in a home. The fact of the matter is baseboards are just as susceptible to dust, dirt and grime as floors are. You can keep your baseboards clean by vacuuming or sweeping away dirt and dust. Once you’ve removed the top layer, you can get rid of those stuck-on stains with a sponge, warm water and soap. Deep cleaning schedule: By regularly cleaning your baseboards, you will improve the overall cleanliness of your home. We open doors and turn light switches on and off daily. When it comes to cleaning these elements though, they tend to get overlooked because they blend in with the walls and doors. In order to fight off the germs that get spread on these areas, use anti-bacterial cleaner to disinfect them. For light fixtures, spray the cleaner directly on a cloth or paper towel. If the switch is dirty, use a Q-tip. Deep cleaning schedule: You should regularly clean all the doorknobs, handles and light switches in your home to combat the spread of germs. 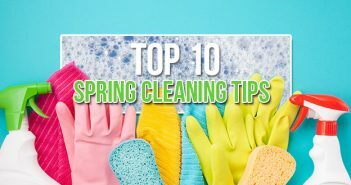 Now that you know how and when to clean the most forgotten areas inside your home, you’ll never have a dirty spot go unaccounted for again. Follow these home cleaning tips and many more in our Home Project Guides, where you’ll learn best practices on how to improve your home. Have a few deep cleaning hacks of your own? Share them in the comments!